David Petersen: Katie, while I figure most people already know about you and your work, talk about the work you do and are best known for. 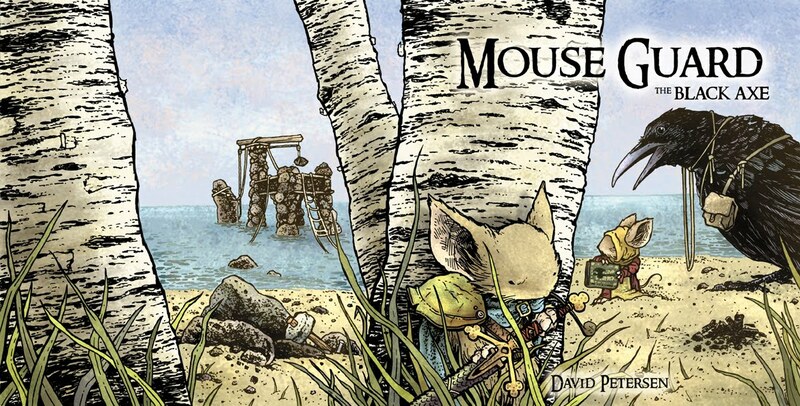 David: How was working on a Mouse Guard story different than working on a Fraggle or Clone Wars story? 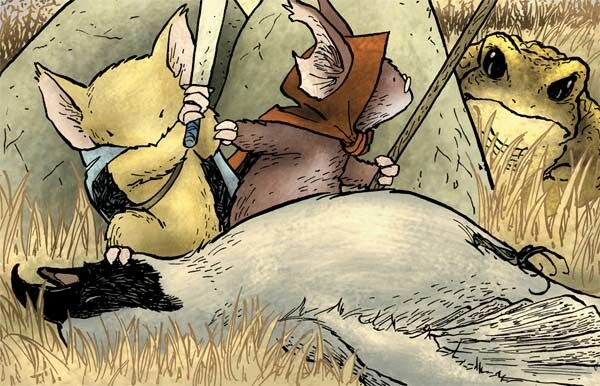 Katie: Mouse Guard stories have more clone troopers. Wait, I think that's the other way around... But really, I love Star Wars. I really do, but with that, I'm working with characters that are already established and have a history that I am in no place to mess around with. 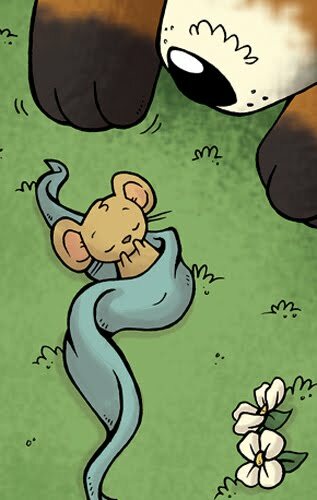 Creating this story for Mouse Guard was more freeing because I was coming up with a small group of characters of my own and making them fit into the world of MG. Also, mice are WAY more fun to draw then clone troopers. David: I know with the Fraggle stories you have worked on, you have worked in a square format before. How do you like it? Do you find it strange to switch back to traditional format for other projects? Katie: I actually really love the square format. I hate to put it this way but I think squares are cute. (That probably came off sounding as stupid as I think it sounded when i typed it) But really, they are. And I think that you get to have a lot more fun composing a page in a square format. I also really like that, since i'm drawing on a 12"x12" sheet of board, it will fit on a drawing board that i can position on my lap so i can draw while i sit on the couch and watch a movie! 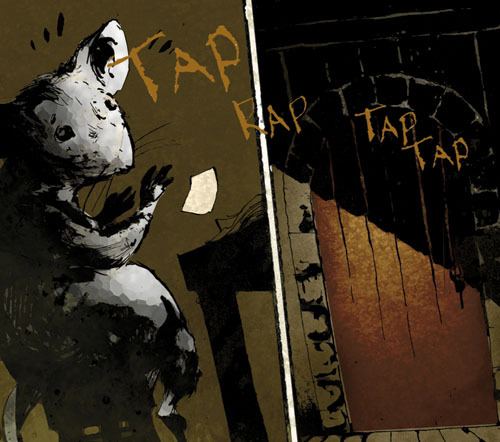 David: So with you being the Queen of Cute, I knew we were going to get an adorable Mouse Guard story from you. But even within your body of work, there is a range of cute-ness, sometimes you aim for a more serious look, other times a so-cute-it-hurts approach. 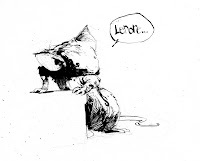 Where does your Mouse Guard artwork fall in there and why? Katie: I am the Picasso of cute! 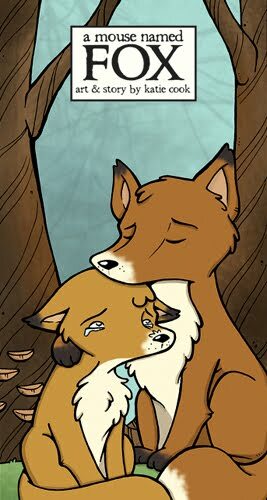 But, like every artist tortured by visions of cute kittens and fuzzy otters, I have a much deeper, darker side hiding within. 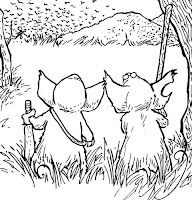 The approach I'll be taking with my MG story isn't going to be Bambie-eyed, chubby-cheeked adorable mice with singing songbirds whirling about their heads as they skip merrily through a meadow, it'll be story appropriate (because my story is a little serious!) but, since it is ME we're talking about, I don't think I can get around it being cute at it's core. David: Mark Smylie had given me a few suggestions for his story. One of them felt like a pure Katie Cook tale, so after asking Mark, we offered it to you as a springboard for your story. However, you offered up a story of your own that I loved even more. Where did that story come from? David: I was really impressed by how nicely it all fit together, I wondered if it was based on a real fairy tale. It felt that Authentic. I think it's so great that was intentional. David: Let’s talk about process. How do you take your script to a drawn & inked page? Feel free to talk about materials and supplies. 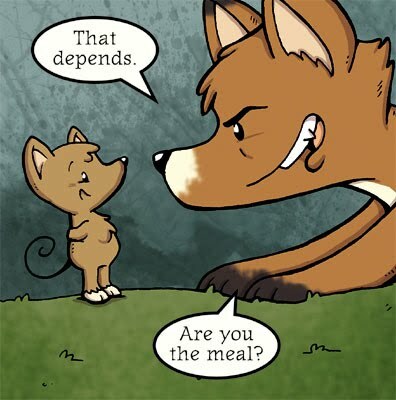 Katie: As much as I love my Cintiq, I still hand draw all my pages before taking them onto the compute to color them. I draw everything out on Strathmore Smooth Bristol Board using a plain ol' .5 mechanical pencil, then ink using an 01 micron pigma pen. after that, I scan everything into Adobe Photoshop CS4 and color! Although, I do sometimes now do all my roughs on the computer. I just pull up my script in one window, photoshop in another and doodle away on the screen. David: Since you know you will be coloring the work, does that affect the way you ink? How do you decide when to let the ink or when to let the color do the work? Katie: My inking style is pretty basic. I like my line work to be clean and meticulous. so, mostly, i just go crazy coloring it later on. 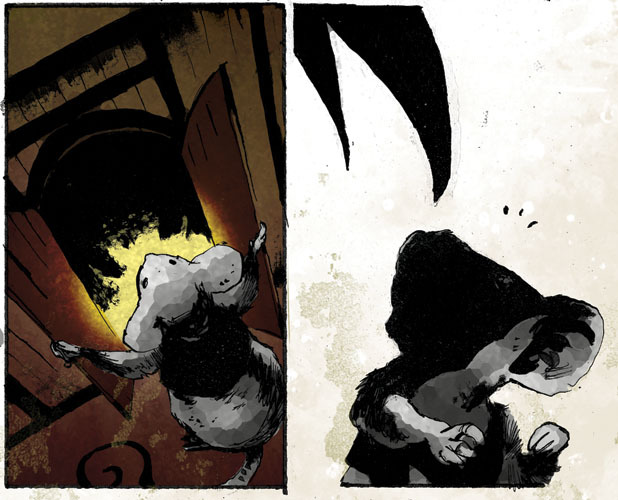 I'd much rather have the "undo" button on my side instead of going crazy inking the page and going... "oops, wish i hadn't just put that there..."
David: Speaking of color, What kind of process did you use to color your Legends story? Katie: After I scan in the black and white art, I flat out all my colors. Then I build shadows, highlights and textures on separate layers from there. My files always have a million layers, it's crazy. i seriously have layers named things like "shadow 2 for rock #4", "flesh highlight 3 nose" and ""wemb trop patn lft shldr". *I* know what it means though, so it's all good. David: Where can people find out more about Katie Cook and all she’s up to? 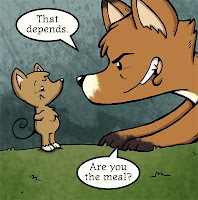 Katie's Story 'A Mouse called Fox' appears in Legends of the Guard issue 3. David Petersen: Jason, You lead two different artistic lives it seems, one as a comic book artist and the other as a fine art/gallery show painter. Do you see these as being very different or is creating work all part of the same process for you? Jason Shawn Alexander: Right now they are very different. Aesthetically, socially, and in my process. My personal work has no story to tell. If it does, it's subconscious. It's becomes more and more abstract. It's a release. It has a thought process that is very personal and very private. Very different from comics. My comics work is what I do, not for fun, but for pure enjoyment. there's a difference. The process of visual story-telling is incredible to me. I know I'll do it till the day I die. I would just like to break the seal and do nothing but my own stories. 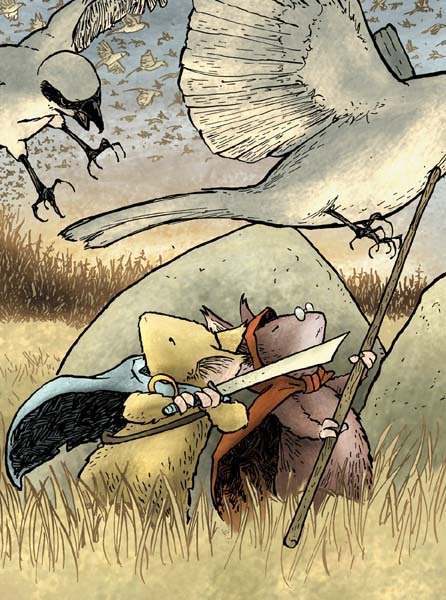 But that includes getting to run wild with other titles, like Mouse Guard. David: How did working on your Legends story differ from your other comic work like Abe Sapien: The Drowning, or Damn Nation? Jason: Because it's my story, well, it was up to me to write/adapt. 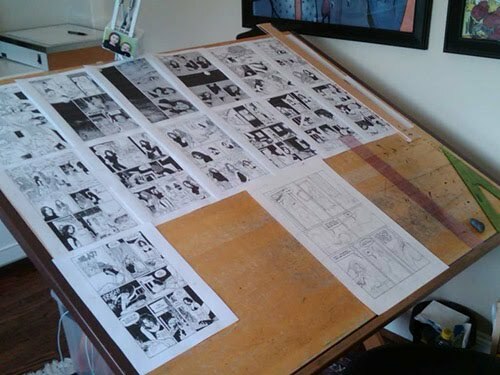 I love nothing more than being in control and laying out my own pages without a panel by panel script. The story-telling aspect is the pay-off for me. David: How did you come to the idea of doing an adaptation of an Edgar Allen Poe story? Jason: I've wanted to adapt this poem for so long, but who wants to see another gothy Johnny Depp and crows.....well, I'm sure a lot of people, but not me. When MG came along, it rang out perfectly. A truly unique take on an icon of loneliness and despair. David: Can you talk about your process? do you thumbnail? do you work directly on the final paper surface? Jason: I thumbnail. That's how I script. Even when I full write my own stories, I write them in screenplay form. 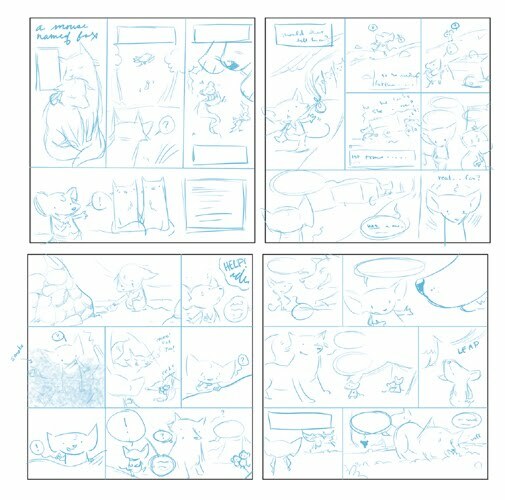 The panel by panel portion comes from me reading and pacing it out in thumbnails. Then very loose pencils and the the rest is all quill and ink. David: What materials do you use to pencil and ink with? Jason: A cheap mechanical pencil. Sharpening pencils irritates me. Then a Gillott 303 nib. Nothing has proven better for me and I've tried tons. I still buy new brands of nibs to see if anything works better for some things, but nothing has. Ink is different. I use a LOT. So I buy cheap. I buy Blick brand Black Cat ink for my nibs and then Speedball ink for my solid black brush work. All on Strathmore 400 series water color paper. 15x22 in. David: Would you say most of the ‘work’ is in the penciling or the inking? That is to say, are your pencils just a guide for the ink work, or are your pencils a tighter recipe for where the ink needs to go? Jason: Everything happens in the ink. If I pencil too much it becomes stiff and I feel like I'm tracing. I need that fear to keep me focused and excited. David: Where can people find out more about you and your work Jason? With the Legends spotlights running the week before an issue comes out and then the 2-3 weeks after, this will be my last personally written post before heading to San Diego (comic con info below). So I hope I tackle everything...and check back next week when the Legends interviews start back up again with Legends #3 creators: Katie Cook, Jason Shawn Alexander, Nate Pride, & Guy Davis. who forged the mythic axe. At the last Ink & Stein, I was confused and mentioned that the July event would overlap with San Diego...well as I say, I was confused, because it doesn't! 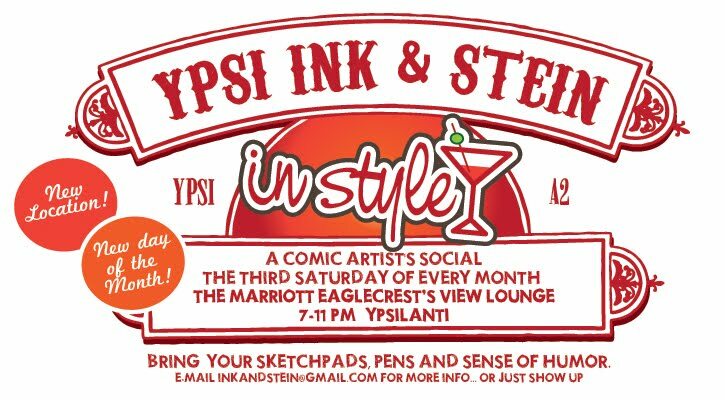 Ink & Stein a a group of artists who gather to draw the 3rd Sat. of every month at the Eagle Crest Marriott Lounge in Ypsilanti, MI from 7pm-11pm. If you live in the area and want to come to this or any month's gathering, please do! A few months ago I was contacted by a scout troop because a fan of mine was receiving his Eagle rank in the Boy Scouts. 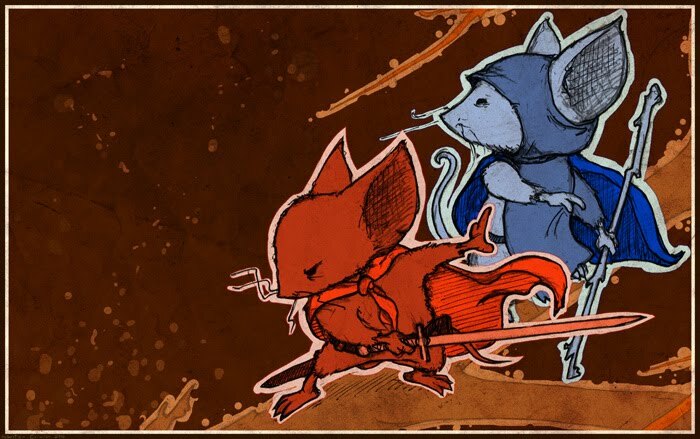 Scouting and Mouse Guard are closely connected in my mind. I was a Boy Scout from age 11-18 and earned the rank of Life Scout. It was in scouting that I met who would later become my best man, the inspiration for Kenzie, and a friend for life. He and I formed the relationship on scouting events, that would become how I write the dynamics of Kenzie and Saxon. 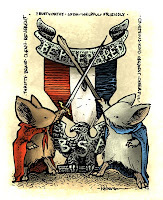 And on a larger scale, many of my scouting experiences: making shelters, hiking, winter camping, cannoning, leadership, and a system of peer-rank advancement, shaped how the Mouse Guard itself functions. Here are the basics: I'll be in Artists Alley at GG09 for most of the show (with my new Celanawe banner!) There I will be signing books, posters, sketchbooks. 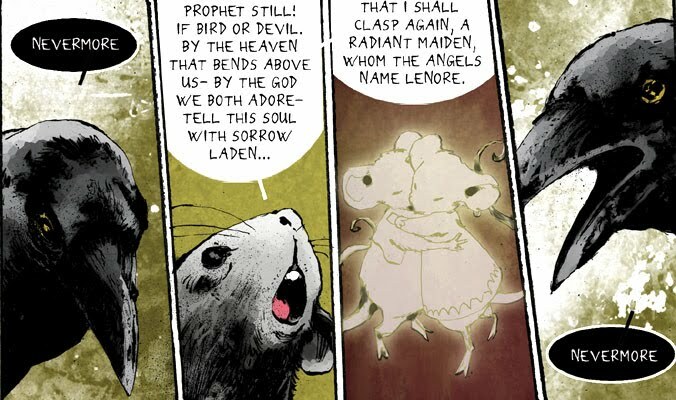 I'll have several signing times at the Archaia booth as well (TBA*). On Sunday the 25th, at 2:30 pm in room 3, There will be an Archaia All-Ages panel featuring Legends of the Guard, Black Axe, and several other Archaia titles like Return of the Dapper Men and Fraggle Rock. Joining me for the Mouse Guard related discussion will be Jeremy Bastian, Katie Cook, and Karl Kerschl. This piece was sent by Sebastien Cormier. Thanks Sebastian! David Petersen: Terry, When I asked if you would be interested in doing a Legends story, you mentioned that you had kinda sworn off anthologies. Why is that? and what made you change your mind for this project? Terry Moore: I found that I would spend a lot of time on an anthology contribution, then nothing would come from it, like nobody ever saw it. You know, like nobody ever said they saw it or anything. And I have to work overtime to do one, because every month I have a new comic issue due. So it just got to where I didn’t think it was worth it anymore. But, with Mouse Guard, that was a no-brainer because I love the book and, as a cartoonist, I knew I would love drawing the mice in their world. So, I guess I do anthologies, but now I’m very, very, very picky. David: I sought out storytellers for this project, that is to say folks who were both artists and writers. With Strangers in Paradise and now Echo you are well known for being a storyteller of his own worlds, but every now and then you play in someone else’s toybox (Birds of Prey, Darkness/Vampirella, Spiderman Loves Mary Jane). Do you find it a relaxing vacation for having the weight of your own worlds on your shoulders? or does it have it’s own stresses of making other people happy and working within the confines of cannon? Terry: It’s a fun break, to think about other worlds and other characters. It does add stress to my life though because, again, the relentless deadline of my own book. I usually don’t get to do one or the other. It’s usually add something to the existing workload, so it has to mean something to me or I can’t do it. David: Your story, The Shrike & the Toad is about clever thinking, and making the best of a bad situation. Where did the story come from? 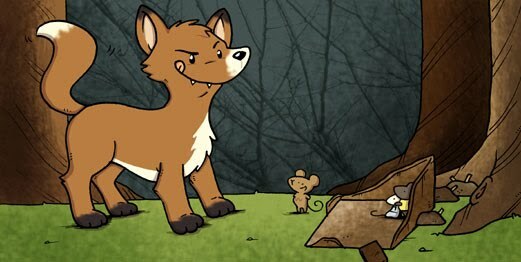 Terry: I just put myself in their shoes, the guardmice, and tried to think of something that might easily happen during the course of the day, to show the resourcefulness of these special little creatures. And I use to draw cartoon toads all the time, so I snuck my fave critter in there. FYI: this was the first time I’ve ever drawn a mouse, but it was great, following your wonderful design/style. David: The story outline you turned in was fairly long considering you had a two page page limit. I was worried that while I liked your story, it could never fit on two pages. However, you turned in the final art on two pages and I don’t see that you left anything out! How did you tackle taking a typed story outline and planning it out to work within a small page count? Terry: Ha! That’s the story of my work life! I write out long scenes for my books, letting characters talk things out, saying too much and all that. Then when I sit down to draw I edit and toss out the unnecessary stuff, and it’s always much shorter and tighter. I like for everything on the page to belong there for a reason. As Strunk & White said, “Kill your darlings.” Meaning: edit out the fluff, even if you like it. David: What is your process for getting artwork to the final surface? Do you draw directly onto it? do you print out blue lined sketches? do you use a light box? Terry: I almost always draw and ink straight to the page, so no blue-line sketches or anything. 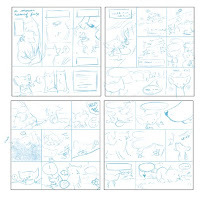 In the case of The Shrike And The Toad, I did a loose thumbnail of the panel layout on printer paper, but there weren’t characters or anything. I threw it out when the real pages were finished. As for a light box, I use one to mark off the measurements of my comic page template. I made a master that I use on the light box. That way I don’t have to measure off every page. David: And for your linework, what do you use to ink with? 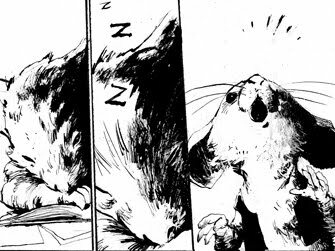 Terry: For Shrike and Toad, I used a 102 quill pen (for art and lettering) that was so broken in it gave out on the final panel. I was inking the tree on the right and a big blob of ink just fell out of the nib. I was horrified because I tried very hard not to have any mistakes on the art. Fortunately I was able to clean it off and cover it up. For my books I use the quill for all but the large figures. For those I use a Raphael #1 brush. 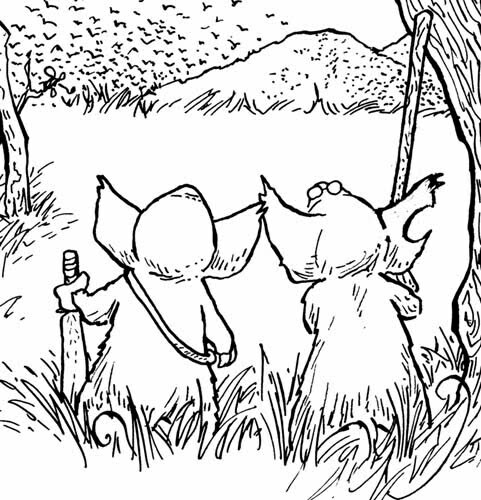 David: I noticed a Charles Schulz-ness to the artwork for The Shrike & the Toad and I see you have mentioned before that Peanuts was an influence on your work. Can you describe how Sparky’s work influenced you and this story? Terry: Every time I draw grass and trees I think of Peanuts. Sparky most of his life staring at the details of his cartooning as he worked, refining his art to the best look. I’ve spent my life looking at his art too. So, it’s inevitable you would see the influences. That’s why you have to be careful what you put into your brain, as an artist. When you see great stuff, devour it. That’s what I learned from Schulz. That’s why I loved contributing to this book! David: The square format is one that I really enjoy working in and I’m finding that the other creators for Legends have enjoyed it and found it challenging. How did you find working in it? Did it affect your layout process? Terry: Square is so much better for me than the vertical format. More natural. Maybe I took to it so easily because it more closely resembled the notebook paper ratio I drew on during school. That’s where I learned to cartoon, in jr. high and high school, making thousands of cartoons on my notebook paper. Never thought I’d say this but, square is cool! 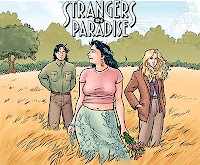 David: Where can people find out more about Terry Moore, Strangers in Paradise, and Echo?